Quebec City is a fabulous destination in any season, but there’s something special about summertime in this city that exudes an abundance of European charm. Multichromatic flowers replace the winter’s snowy landscape and mild summer temperatures beckon everyone outdoors to explore. Here are five reasons to add Quebec City to your summer travel plans. From July 5th-15th, music fills the air in Quebec City as international superstars along with top new talent perform rock, French music, jazz, classical music, hip hop and world music with 11 days of indoor and outdoor concerts. This is Festival d'été de Québec—Canada’s largest music festival which is also recognized as Canada’s largest artistic event. With so many genres you’re certain to find something to feed your musical soul. Summer is the ideal season to explore Quebec City on foot for an up-close look at the city’s history. Designated a UNESCO World Heritage site, Quebec City has the only remaining fortified city walls in North America north of Mexico. Walking atop the wall affords a glimpse into the city’s military history. The French influence is everywhere as you stroll amid the cafes, boutiques and restaurants on Rue du Petit-Champlain—the oldest street in North America. A funicular links Lower Town to the Dufferin Terrace and offers spectacular views of the St. Lawrence River. You can also take the oldest staircase in the city, the Breakneck Stairs (Escalier Casse-Cou) but hold onto the handrail, these stairs have earned their name. History’s the focus for the New France Festival where visitors experience life as it was in New France during the French Regime in the 17th and 18th centuries. Choose your character and dress the part to join the celebration at Fêtes de la Nouvelle-France. In 1608, New France began in Quebec City. The festivities are held in Old Quebec (Vieux-Quebec) where 17th and 18th-century homes line narrow cobblestone streets. Here you’ll find Place Royale—the site of the first permanent French settlement in North America. Place Royale is also home to Notre-Dame-des-Victoires, the oldest stone church in North America, built in 1688. The festival’s five-day program is all about costumed fun. Demonstrations of canoe making techniques from the 17th-century are followed by wheel barrow races, parades, dances, entertaining shows and plenty of street entertainment. There’s plenty of delicious food on hand too. Don’t miss the chance to gobble up a massive turkey leg. Costume tip: Opting for the cooler wardrobe, I chose to be a peasant. My lightweight costume kept me cool while the bourgeois and nobles in my group were sweating in their heavy attire. Sometimes it’s good to be the peasant. If Quebec City had a castle, the Fairmont Le Château Frontenac would be it. This spectacular hotel has dominated the city’s skyline for 125 years—an anniversary to be celebrated. Since opening its doors in 1893, the Fairmont Le Château Frontenac has hosted countless dignitaries, celebrities, and even royalty. Notable guests include King George VI and Queen Elizabeth, Princess Grace of Monaco, Charles de Gaulle, Prince Andrew, Charles Lindberg, and Alfred Hitchcock. Located inside the walls of Old Quebec, the Fairmont Le Château Frontenac has undergone a multimillion-dollar renovation project that successfully blended the charm of the hotel’s past with modern innovations. 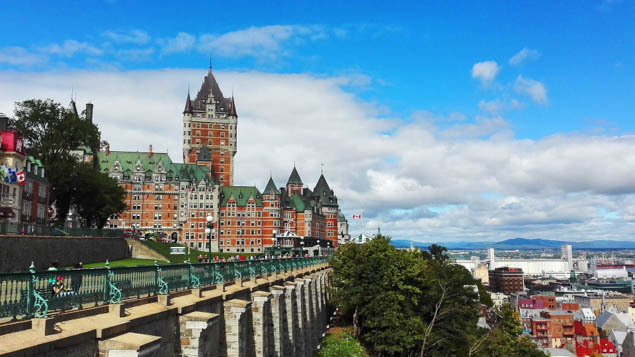 Even non-royals will appreciate the breathtaking views of the St. Lawrence River and the architectural details of this stately and luxurious hotel. Just over the Île d'Orléans Bridge from Beauport, another side of Quebec City is revealed—its countryside. One of the first areas of the province to be colonized by the French, the Île d'Orléans sits within the St. Lawrence River and offers a bounty of agriculture. Fields of strawberries, apple orchards, and vineyards blanket its landscape while picturesque villages provide a peak into the history of the island. The village of Sainte-Pétronille at the island’s tip affords spectacular views of the majestic Montmorency Falls as well as the cityscape. The island’s oldest parish, Saint Famille, is home to a concentration of historic stone houses dating back to the 17th-century including Maison Drouin, one of the earliest dwellings in the region. An abundance of farm stands and vineyard tasting rooms provide ample opportunities for sampling Île d'Orléans’ agricultural treasures. It’s a lovely way to spend a sunny summer afternoon. Have you visited Quebec City? What were your favorite experiences?